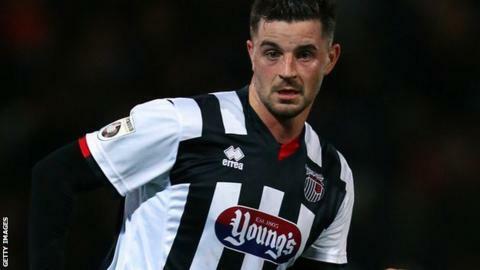 Padraig Amond scored a hat-trick and took his tally of league goals for the season to 30 as Grimsby climbed up to third with victory at Woking. Amond fired the visitors ahead after being teed up by Andy Monkhouse. Woking's Cameron Norman saw his free-kick crash against a post before Amond netted his second following good work from Omar Bogle and Craig Disley. Bruno Andrade slotted home from close range to pull a goal back, but Amond sealed the points with a cool finish. Grimsby, who were beaten in last season's play-off final, need two points from their remaining two games to secure a top-five spot this term. "We started against a Grimsby side who started very quickly and moved the ball around and showed a lot of quality in a big way. "We found ourselves 1-0 down in the first 20 minutes. they had players all over the park and we couldn't really live with them - they were playing some superb football. "Playing against such a good side, a lot of teams would have turned around and buckled and folded, but I felt we showed a great deal of character and commitment and for a 15-minute period we played some very good football." Match ends, Woking 1, Grimsby Town 3. Second Half ends, Woking 1, Grimsby Town 3. Substitution, Grimsby Town. Shaun Pearson replaces Omar Bogle. Substitution, Grimsby Town. Jon-Paul Pittman replaces Padraig Amond. Substitution, Grimsby Town. Craig Clay replaces Andy Monkhouse. Substitution, Woking. Godfrey Poku replaces Cameron Norman. Goal! Woking 1, Grimsby Town 3. Padraig Amond (Grimsby Town) right footed shot from the right side of the box to the top left corner. Assisted by Omar Bogle. Attempt missed. Jon Nolan (Grimsby Town) left footed shot from outside the box is too high. Attempt saved. Bruno Andrade (Woking) right footed shot from outside the box is saved. Attempt saved. Giuseppe Sole (Woking) header from the centre of the box is saved. Goal! Woking 1, Grimsby Town 2. Bruno Andrade (Woking) left footed shot from the left side of the box to the bottom right corner. Assisted by Giuseppe Sole. Substitution, Woking. Joey Jones replaces Matt Butcher. Goal! Woking 0, Grimsby Town 2. Padraig Amond (Grimsby Town) right footed shot from the centre of the box to the bottom left corner. Assisted by Craig Disley. Attempt missed. Bruno Andrade (Woking) right footed shot from outside the box misses to the right. Attempt missed. Cameron Norman (Woking) right footed shot from outside the box misses to the left. Attempt saved. Omar Bogle (Grimsby Town) left footed shot from outside the box is saved. Second Half begins Woking 0, Grimsby Town 1. First Half ends, Woking 0, Grimsby Town 1. Attempt saved. Keiran Murtagh (Woking) right footed shot from the centre of the box is saved. Assisted by Bruno Andrade with a cross.